Haskovo Hotel in Haskovo city, Bulgaria. Bookings and accommodation. 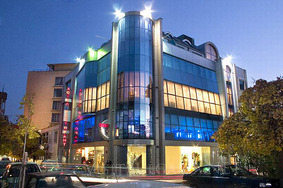 Location: Hotel Haskovo is located at the centre of Haskovo city. Very close to the main administratic buildings. Accommodation: Hotel Haskovo offers very comfortable spacious bedrooms. Specially designed rooms of individual interior with cable TV and adjustable air-conditioning. Services: Hotel Haskovo offers free parking places for the guests. Restaurant Haskovo, a prefered place by mane of our guests along with the local rotary club. It organizes private dinner parties, birthday Parties, themed brunches, cocktails and weddings. The hotel also disposes of Nabu Cafe Club.